With 1 CD. 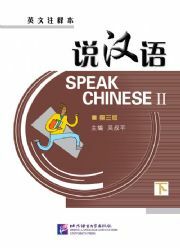 Volume 2 of Speaking Chinese (3rd Edition) has altogether 20 lessons in 7 units covering topics such as Chinese Customs, Marriage, Architecture in Beijing, Visiting Someone, Education, Local Flavor, Visits. About the Author(s) Wu Shuping, teacher in the College of Advanced Training, Beijing Language and Culture University, has been engaged in teaching Chinese as a foreign language for a long time and has rich experience in teaching and textbook compilation. The published books include A Panorama of China, Contemporary Chinese, HSK Simulated Tests (Elementary), Chinese Today, Speaking Chinese, 380 Chinese Verbs, etc. New Paperback 18*25 cm, 174 pp.